The first one makes me cry, and the second one is such a good use of teh prompt, liek whoa! The framework around the mirror is awesome, and I like how you can diferrentiate all four houses in the Great Hall. So awesome! I love them both, especially The Mirror of Erised. Your anatomy is so perfect that it's easy to tell that Harry is a young kid just from the rear view, even without the scale of the mirror or his reflection. And it is totally cool that you used a scene from canon to depict the Great Hall! Total brilliance! I really love the colors in these! Ok once again you amaze me with your vision and attention to detail, but especially how it all blends so seemlessly into a beautiful whole. 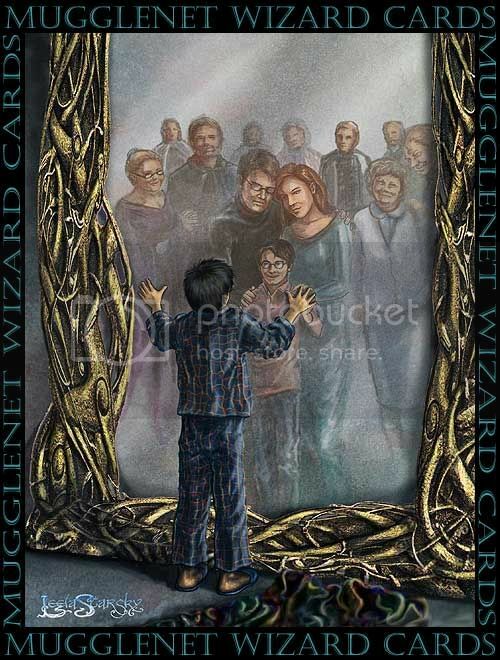 Love the Mirror of Erised one - the frame is just gorgeous and I would very much like something like that for my home and of course Harry is so tiny and sweet and I just want to huggle the poor little thing to pieces. In the Great Hall one. I really like the effect of having the lines of color with the students house robes. The black used in the film is more practical, but this makes the picture more interesting. 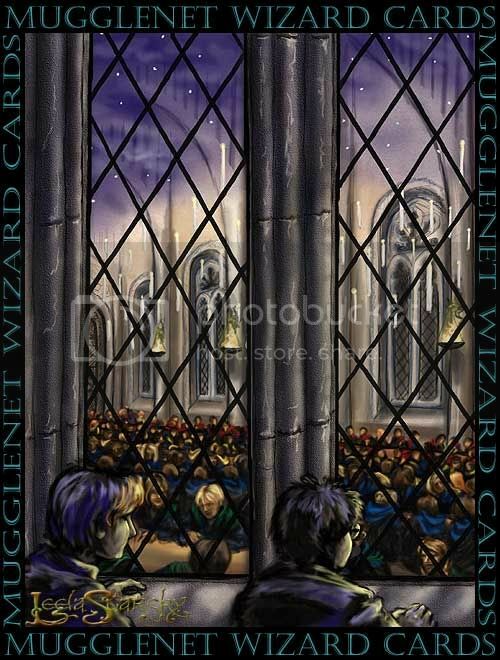 Also love the light coming through the windows and how it shades Harry and Ron's hair. Just awesome. I have to agree that the first one is heartbreaking. I do think the second one is more intersting how you drew it. They are both so beautiful. I can't wait to see Molly and Arthur's cards. Aww, poor little Harry. He looks so happy. The second one is awesome. I love it! Your use of color is really amazing in that picture. Good stuff! Awwww... wee!Harry is too precious! Ooh. These are so beautiful. Wonderfully done. The Erised one is just so sweet. Poor Harry. those are so pretty! wow!!! those are so nice! That is absolutely frigging amazing. I especially like the second one. Ah, the colors, and all the faces... so nice! :D Really good work. That top one is amazing! Fantastic, hon. I've been forgetting to comment, due to tiny offspring bouncing off my legs (he's 21 months), but i've been watching. you're such a talented artist! !